On June 21, 2012, a day dedicated to music, celebrating the European Day of Music simultaneously in 30 cities in Greece, including Paros, and 25 countries in Europe, forming part of the Network of European Music Day. The celebration is based on volunteerism and provide an opportunity for amateur and professional musicians to spread their musical message to a wide audience. All concerts, workshops and seminars carried out within each event is free to the public. Musicians from other parts of Greece will come to Paros Park and the beach of the Catholic, in an atmosphere of celebration and unity, to participate in this multi-cultural fiesta of music. With us this year is Rock band from Evergreen Paros, the 0Land and Sea with ethnic sounds from ancient Greek musical instruments, while the Tribal West & Aftrotone Project will carry on the coast of Paros, the sounds and rhythms of Africa. A special light percussion workshop will take place during the events, where participants can take part in their own percussion to improvise (with bottles, spoons, etc.)! The European Music Day will result in a metamesonychtio techno-electro party with Djs Billy Nick and Jimmy Gemma on decks. We invite you to come and join in the celebrations of the 13th European Music Day in the Park with us, an ideal place to enjoy such a pleasant event and live music from 5 pm until 4 am, near the sea and under the moon and stars. 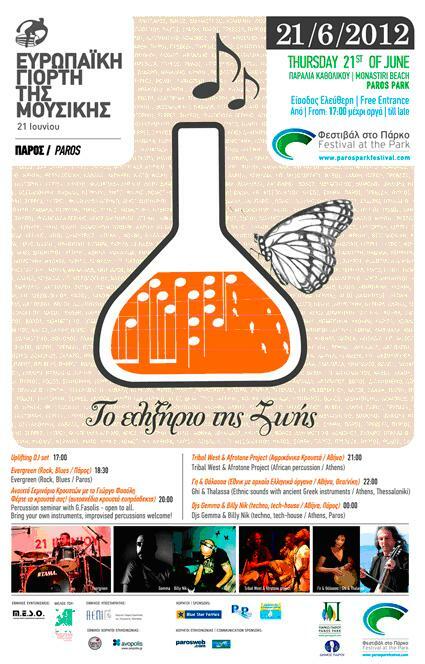 MESO, the Greek branch of the European Music Day, AEPI, Best 92,6 FM, Avopolis, the Blue Star Ferries, Porto Paros, Alexander-Windmill Travel, ParosWeb, ParosLife, and the Environmental and Natural Park of Paros, the Municipality of Paros, Bluestar Ferries, the Porto Paros, the Women Association of Naoussa and the dedicated volunteers of the Park of Paros, offering valuable help and support each year.